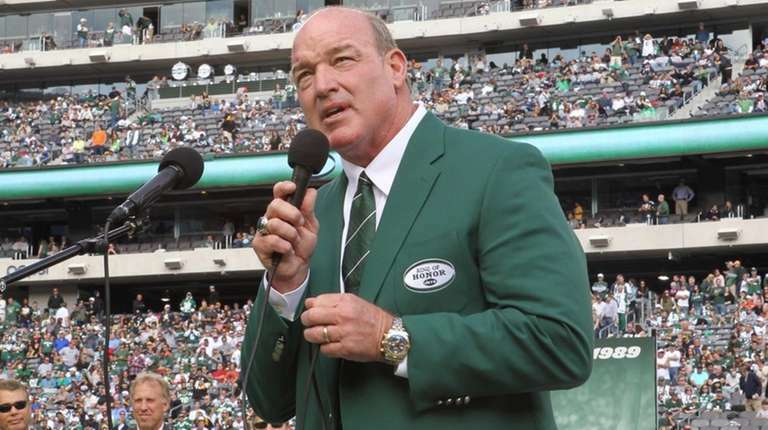 Marty Lyons, the former Jets defensive lineman and current radio analyst, will miss at least the first two preseason games as he continues to recover from a stroke he suffered on July 11. Lyons said on Tuesday he is feeling better but still is experiencing some double vision, which he has been told should continue to improve and return to normal within about 90 days. Lyons, a Jet from 1979 to 1989, had been spending time with family and friends after returning home to Smithtown from his charitable foundation’s golf outing on July 10. He went to bed but woke up an hour later feeling leg cramps. “I went to get up, and the next thing I knew I had paramedics around me,” he said. His eldest son, Rocky, is a doctor, and another son, Jesse, is in medical school and both were home at the time and tended to him until paramedics arrived and transported him to a hospital. He said his blood pressure spiked to dangerous levels. Lyons, 60, said he felt fortunate to be surrounded by family and friends, and to have two familiar doctors in Ernie Vomero and Brian McKenna oversee his care. Eventually an MRI revealed a mild stroke. The incident first was reported by ESPN New York. The Jets’ first two preseason games are Aug. 12 against the Titans and Aug. 19 at the Lions. Lyons hopes to be back for the Aug. 26 game against the Giants.